Bangladesh has slipped 10 notches in the Happiness Index but it is still ahead of India, Sri Lanka and Myanmar. 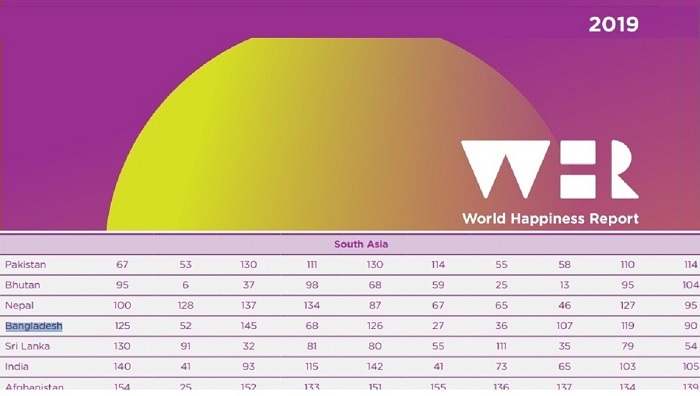 According to World Happiness Report 2019 released on Wednesday coinciding with the United Nations' International Day of Happiness, Bangladesh placed 125 among 156 countries of the world while Sri Lanka and India are at 130th and 140th position respectively. Pakistan was ranked 67th while Bhutan 95th and Nepal 100th in the Happiness Index. In the last year's index, Bangladesh was the 115th happiest country of the world, reports UNB. The report ranks countries on six key variables that support well-being: income, freedom, trust, healthy life expectancy, social support and generosity. The report was published today by the Sustainable Development Solutions Network for the UN. Finland is the world's happiest country for the second straight year followed by Denmark, Norway, Iceland, the Netherlands, Switzerland, Sweden, New Zealand, Canada and Austria. They are followed by Australia, Costa Rica and Israel. People in South Sudan are the unhappiest with their lives, according to the survey, followed by Central African Republic (155), Afghanistan (154), Tanzania (153) and Rwanda (152). The rankings of the world's happiest countries came from an analysis of data from surveys in 156 countries taken from 2016 to 2018. Since 2013, the United Nations has been celebrating the International Day of Happiness on March 20 as a way to recognise the importance of happiness in the lives of people around the world.